Check out our new Thomas Fire Project, hosted at MYSTERY RANCH! THOMAS FIRE: A multimedia exploration of how we experience fire. The American Wildfire Experience (AWE) is a small non-profit rooted in understanding, examining, and telling the story of wildland fire. Through multimedia storytelling, oral histories, and other projects and initiatives, AWE works to facilitate dialogue, communication, and education around the challenges and opportunities of our current wildland fire situation in the United States. We believe that sharing scientific data and knowledge tied together with human experience is the best way to tell the story of wildland fire and to have an impact on the way in which wildland fire burns across both our social and ecological landscapes. Here is a short video from one of our projects, The Smokey Generation, of the power of story. 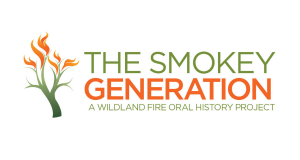 AWE is the parent organization of The Smokey Generation, a wildland fire oral history and digital storytelling project. The Smokey Generation is a passion project founded by Bethany Hannah. The website was created as part of her thesis project for her Master of Arts degree in Environmental Studies (with a concentration in wildland fire management and communications). Her goal is to collect and share stories from wildland firefighters throughout the country so that we can preserve the history and culture of the wildland firefighting industry and stimulate discussion about wildland fire itself. With more than 100 oral history interviews, representing every decade from the 1940’s to present, the collection is a rich and engaging representation of the world of wildland fire. 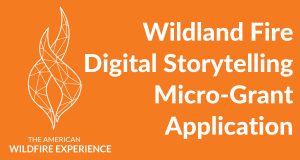 AWE is excited to announce the launch of our inaugural Wildland Fire Digital Storytelling Micro-Grants alongside this Thomas Fire project. Open to individuals working in the wildland firefighting industry, we are offering five (5) $500 micro-grants to wildland firefighter photographers, videographers, and writers with intent on telling the story of their wildland fire experience during the coming 2019 fire season. The application period runs from December 4, 2018 to January 12, 2019 (spanning the anniversary of the initial attack through containment of the Thomas Fire). Click here to apply. Please be patient while we’re building out our website!